Nottinghamshire construction company Woodhead, is set to begin work on a brand new £4.7m business innovation hub on the University of Nottingham’s Jubilee Campus. The Technology Entrepreneurship Centre (TEC) will be the latest addition to the University of Nottingham Innovation Park, and forms the basis of the University’s successful application to be one of the first University Enterprise Zones in the country. 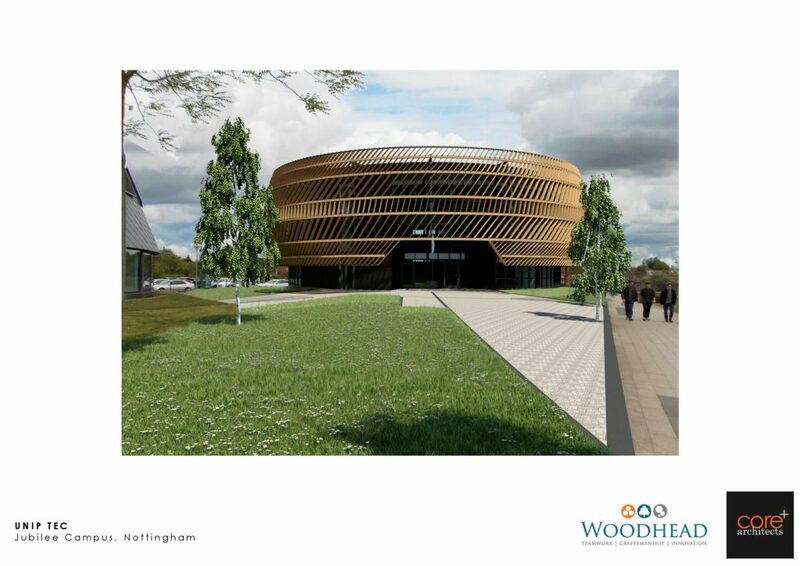 Following on from previous successful projects completed for the University and a number of other educational establishments across the East Midlands, Nottinghamshire based Woodhead was selected to deliver the 11 month scheme. Designed to reflect the local industrial heritage of the Innovation Park, the building’s architecture honours the Raleigh cycles factory, which started manufacturing bikes in this area of Nottingham during the late Victorian era. The factory dominated the site throughout the twentieth century, employing more than 8,000 people at its height. The building will include a range of different office spaces for start-up technology businesses, as well as communal catering facilities, seminar rooms and meeting rooms. It will be built to meet BREEAM ‘excellent’ standards, ensuring the structure meets an international standard for best practice in sustainable building design and energy efficiency, while reducing carbon emissions and incorporating low carbon technologies. Sitting behind the Sir Colin Campbell Building, adjacent to the River Leen, work will begin on the project in September 2015, expected to complete in Summer 2016. Woodhead’s Construction Director, Craig Pygall, said: “We’re delighted to again be working in partnership with the University of Nottingham on such a prestigious project. The TEC Incubator Building will be an iconic structure, in the heart of the thriving Jubilee campus. The project is being co-funded by the Department for Innovation and Skills, University of Nottingham and the Haden Green Trust. • Architect for the scheme are Bond Bryan, with Arup acting as services and structural engineer. Thornton Firkin are the project managers and Turner & Townsend are the cost managers.